The inspiration for this mural was a classic movie. Madison is a huge Wizard of Oz fan! 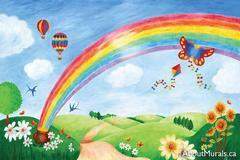 We looked at wall murals with a Wizard of Oz theme, but Madison kept coming back to the rainbow. 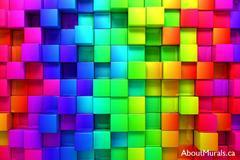 It’s such a pretty way to add a splash of colour to a bedroom. 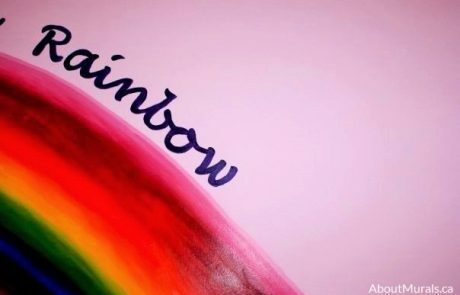 Her parents painted a pink feature wall beside her bed, leaving the other walls purple. 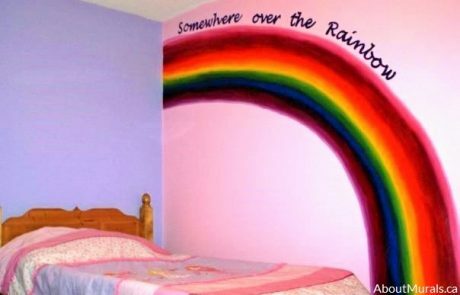 For the wall mural, I painted a giant rainbow over her bed with the words “Somewhere over the Rainbow” written over it. The great thing about kids wall murals is that they can be personalized with favourite quotes, song lyrics or even your child’s name.